I bought these gorgeous fabrics. Normally I have difficulty finding fabrics for a particular pattern. This time I found the fabrics w/o a pattern in mind and I'm having a total block on how to best show case these fabrics in a quilt! Please help me find the purrrrrfect pattern! Thank you! The stripped fabric doesn't look like it blends, but it does. I was actually picturing using it as my binding. 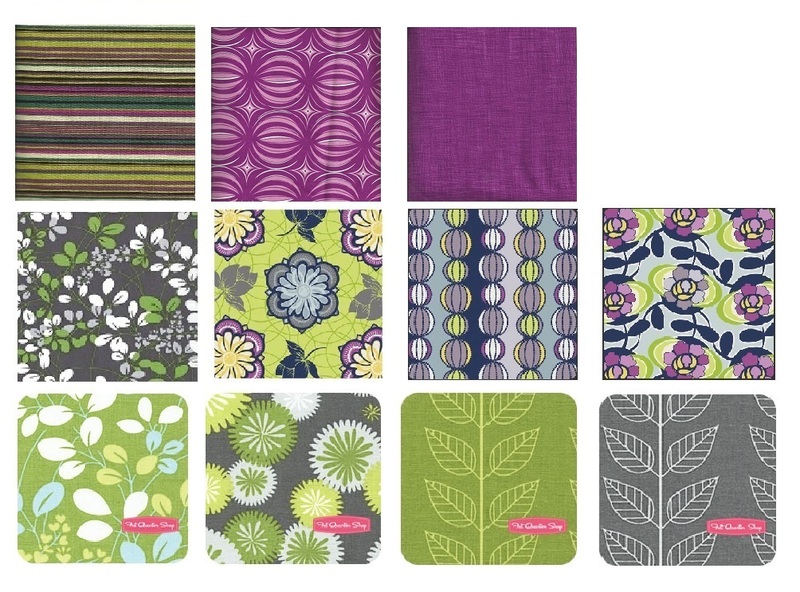 I just got the "Swoon" pattern download from Connecting Threads and it would be great in these fabrics. Gorgeous fabric! Yep, I have done that also. Your stripe fabric would be gorgeous cut on a diagonal for the binding - also easier to match up seams. striped fabric is awesome for binding. Sorry, I have no ideas, but you picked a gorgeous collection. How about Shadowbox with the darker purple as the shadow? Beautiful fabrics and I would use the stripe for the binding too. I usually do straight edge binding but in this case I might do bias binding to get the Barber pole effect. Chopsticks would be cute in this if you had enough of the fabric that reads solid or add one like a white. When I saw your fabrics I thought of the "Swirly Girls designs" a pattern called "Focus Pocus" - I saw the pattern on this board - one of our members - Tealfalcon - has the quilt as her avatar. Try looking it up on this board - I haven't quite figured out how to link it here. You got some really good suggestions. Lovely material. Let us know what you decide to do with it. It's kind of like "Fatty Fatty Two by Four" by Thimbleberries?? Thank you! I found the Fatty Fatty pattern. 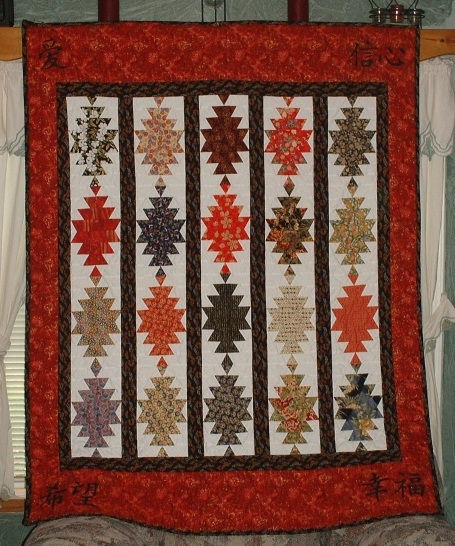 Omg, the fabrics that the actual pattern used made the quilt look ugly! I'm always amazed at how different the same pattern can look based on the fabric/colors used.